Moonlight Amphitheater was once just a concrete stage with no amenities such as electricity, running water, or bathrooms! It was believed that the small stage and grassy tiers could be home to musical theatre under the Vista sky. A meeting set in motion the development of musicals jointly produced by the city and the school district. 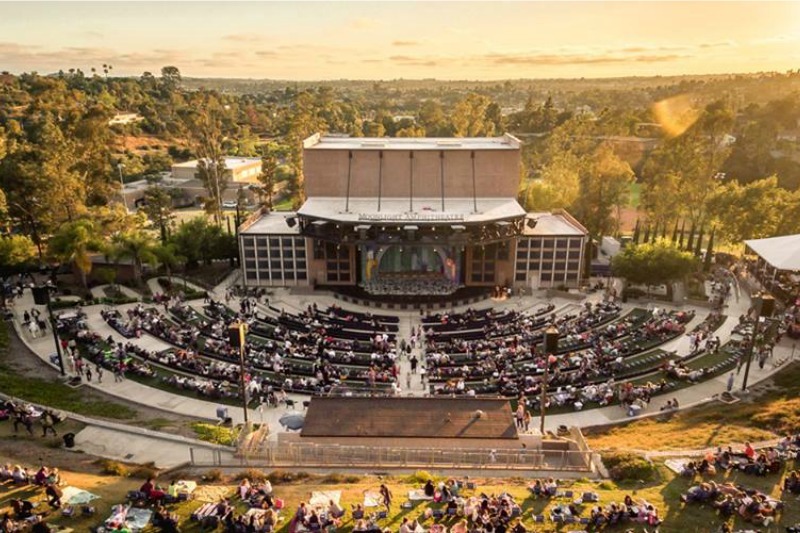 In 1984, the “Vista Summer Theatre Festival” was brought under the umbrella of the city and the theatre was renamed the Moonlight Amphitheater. Moonlight Stage Productions is recognized as one of San Diego County’s major theaters and is critically acclaimed for its Broadway-quality musicals. Led by Producing Artistic Director Steven Glaudini the Moonlight is experiencing an exciting period of audience growth and artistic vigor. Combined with Glaudini’s artistic direction and buoyed by the re-construction of the Moonlight Amphitheater in 2008/09 with a state-of-the-art stage house, the Moonlight Amphitheater welcomes its audiences to experience Broadway’s Best Under the Stars. Picnicking: bring your own picnic supper to the Amphitheater and enjoy some social time with family and friends. Gates open 1.5 hours before each show so that you can enjoy picnicking under the summer sky. Dining: the on-site restaurant, the Luna Café, opens two hours before every summer musical. Concessions: the Luna Café also runs two concessions stands at the Amphitheater. A wide-variety of food and drinks are for sale before the show and during intermission. Free parking is available adjacent to the Amphitheater within Brengle Terrace Park. Look for the directional signs as you drive into the park. They operate a free shuttle in the main grass parking lot before and after the show. Inspired by the twisted genius of Roald Dahl, the Tony Award-winning Roald Dahl’s Matilda The Musical is the captivating masterpiece from the Royal Shakespeare Company that revels in the anarchy of childhood, the power of imagination and the inspiring story of a girl who dreams of a better life. Matilda is a little girl with astonishing wit, intelligence, and psychokinetic powers. She’s unloved by her cruel parents but impresses her schoolteacher, the highly loveable Miss Honey. Packed with high-energy dance numbers, catchy songs and an unforgettable star turn for a young actress, Matilda is a joyous girl-power romp. Children and adults alike will be thrilled and delighted by the story of the special little girl with an extraordinary imagination. July 17- August 3. From the first notes to the final breath, West Side Story is one of the most memorable musicals and greatest love stories of all time. Arthur Laurents’ book remains as powerful, poignant and timely as ever. The score by Leonard Bernstein and Stephen Sondheim is widely regarded as one of the best ever written. The world’s greatest love story takes to the streets in this landmark Broadway musical that is one of the theatre’s finest accomplishments. Shakespeare’s Romeo and Juliet is transported to New York City as two young, idealistic lovers find themselves caught between warring street gangs, the “American” Jets and the Puerto Rican Sharks. Their struggle to survive in a world of hate, violence and prejudice is one of the most innovative, heart-wrenching and relevant musical dramas of our time. August 14-31. Victor/Victoria is a witty, comic romp examining questions of gender, identity, and love, set in Paris in the 1930s. English soprano Victoria Grant finds herself at a nightclub, without work or money. She meets Carroll Todd, or “Toddy,” a performer at the club who gets fired while trying to help her. The two soon team up and embark on an unlikely (and surprisingly successful) scheme.The show is based on a 1933 German film, written by Reinhold Schünzel and titled Viktor und Viktoria. The story was reworked as a musical film in 1982. The film starred Julie Andrews and had a script by Blake Edwards (who also directed) and Hans Hoemburg, music by Henry Mancini and lyrics by Leslie Bricusse. September 11-September 28.